"The Key to Being a Highly Successful Woman"
self-love and finding every balance and confidence within your beautiful self. CUPERTINO, CA (PR Buzz) – March 31, 2019 – – Many women fall into a trap of finding love and completeness from every entity but themselves. As this happens, self-worth diminishes and emptiness replaces it, which effectively takes away the capacity to be truly happy and highly successful in life. This should not be the case. If these women can realize the truth about themselves and how great they can be to themselves and society, this world will definitely become a more inspiring place to live. In "The Key to Being a Highly Successful Woman," Caryn Ross pursues her advocacy of inspiring not just women, but every individual to be successful in their chosen life path. This book is all about living life optimally without wasting a single day of doubting oneself, but rather keeping oneself away from being swallowed by life’s downturns. There are 140 AHAmessages™ pulled out from this book, "The Key to Being a Highly Successful Woman," all of which are impactful, essential, and truly worth a moment of reflection. Reading the AHAmessages is indulging and inspirational, and you will want to reflect on these time and again. "Caryn Ross's words are what every person needs to spend a moment with because of her meaningful personal and professional life reflections. Through 'The Key to Being a Highly Successful Woman,' we will be confronted with the reality that how we see the world fully depends on how we perceive ourselves," says Mitchell Levy (http://aha.pub/MitchellLevy), Global Credibility Expert and The AHA Guy at AHAthat® (https://AHAthat.com). When you manifest #SelfLove in your life, you can break your stagnant cycles, explore your true inner self, and unlock your full potential. #HighlySuccessfulWomen http://aha.pub/CarynRoss. If you separate your personal and professional lives, it will be nearly impossible to create a successful holistic you. #HighlySuccessfulWomen understand this. http://aha.pub/CarynRoss. Perfection is not an attainable goal. If you treat it as such, you will continually beat yourself up when you make a mistake. 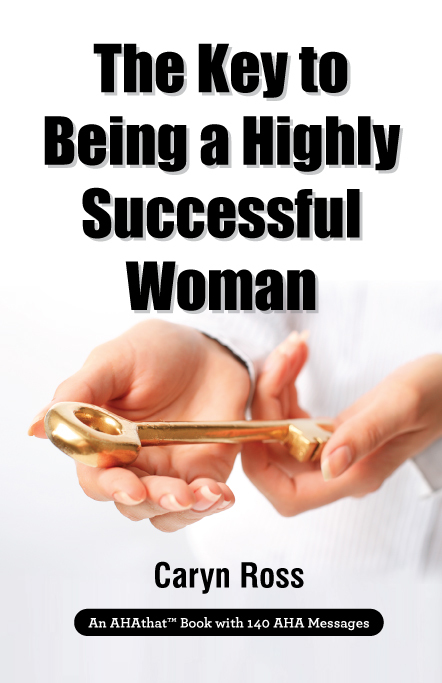 #HighlySuccessfulWomen http://aha.pub/CarynRoss. When you start doubting your self-worth, process it, accept it, don't dwell, and then #Realign yourself to get back on track. #SelfLove #HighlySuccessfulWomen http://aha.pub/CarynRoss. Pick which driver is behind your decision making — your ego or self-love — to determine your worth. #HighlySuccessfulWomen http://aha.pub/CarynRoss. Read and share AHAmessages in this AHAbook on Twitter, LinkedIn, and Facebook by going to http://aha.pub/SuccessfulWomen.